Edited by Mahin Khatami . 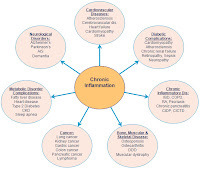 understanding on the role that acute and chronic (persistent or subclinical, unresolved) inflammation plays in preventing disease or inducing many potentially interrelated illnesses has slowed down progress in preventing or treating these chronic diseases or cancer. For example, continuous controversies and debates in the literature, on whether inflammation is protective in preventing cancer or it is a risk in carcinogenesis, have been costly for cancer patients, despite the tremendous public investment in war against cancer for over four decades. In recent years, acute inflammation has been defined as an evolutionary inherent property of immune system, possessing 2 biologically opposing arms, ‘Yin’ (apoptosis, growth-arresting, or tumoricidal) and ‘Yang’ (wound healing, growth-promoting or tumorigenic), processes that protect the body against foreign external or internal elements throughout life. Unresolved inflammation has been further suggested as the loss of balance between ‘Yin’ and ‘Yang’ that would lead to altered dynamics of immune responses, expression and co-expression of exaggerated mismatched mediators in the susceptible tissues, creating immunological chaos (‘immune tsunami’) and damaging the architectural integrity and function of tissues that are naturally immuneresponsive or immune-privileged, and initiating a wide range of inflammatory diseases or tumorigenesis (Khatami 2008, 2009, 2011). In recent years, the interest in multidisciplinary fields of inflammatory diseases has intensified. Specifically, over the last decades, the number of federally funded projects and related networks or technologies that focus on the role of inflammation in cancer research has significantly increased. This book is a collection of comprehensive reviews contributed by experts in diverse fields of acute and chronic inflammatory diseases, with emphasis on current pharmacological and therapeutic options. Interested professionals are also encouraged to review the excellent contributions made by experts in a second book entitled ‘Inflammation, Chronic Diseases and Cancer’, which deals with immunobiology and clinical perspectives of mechanisms of immune inflammatory responses in the genesis and progression of a number of inflammatory diseases and cancers, as well as perspectives for design of clinical trials, therapeutic approaches, and for diagnosis or prevention of disabling diseases, particularly as aging population is increasing globally. friend who encouraged me professionally throughout the years; and John H. Bayens, PhD, Distinguished Professor at the University of South Carolina and long time colleague who generously supported my work in multidisciplinary fields of inflammation, diabetes and cancer research. The author also wishes to pay tribute to the memory of her good friend and colleague Shirin (Shirley) Mirsepassi (Tollouie), MD, pathologist (1944-2011) whose true friendship and support were above and beyond the call of duty.